EM Solutions March 2019 - NEW FEATURES! I recently listened to an interview with author and professor Sean McFate. In the interview he discusses the changing landscape of warfare and what the US must do to keep up, particularly since we are still largely stuck in a mindset of conventional warfare. For those interested in this very insightful interview, it was on The Security Studies Podcast. Obviously, a great deal has changed over the decades in warfare, but many philosophies and perspectives have remained the same. As I listened to the interview, I found McFate's words to ring true for emergency management as well. We have had some changes in focus from civil defense, to natural hazards, to terrorism, and now toward what seems to be the most comprehensive all-hazards perspective we've ever had. We've also had changes in technology and methodologies, but we still seem stuck in a lot of old ways of thinking. Emergency management isn't linear. In fact the lines are blurred so much that it's hardly cyclical (another old way of thinking). Tim Reicker is a founding member, partner and principal consultant with Emergency Preparedness Solutions, LLC, a private consulting firm serving government, businesses, and not for profit organizations in various aspects of emergency and disaster preparedness. When you run into a situation that threatens to disrupt operations, reputation, and your bottom line, a brand-new "To Do Now!" list snaps into existence with alarming speed. Over our decades of experience working with clients in nearly every industry, we've found a few steps to be most important in getting off to the right start. Breathe. Yes there's an urgent need for response, yes you have 300 different things to do, but it won't help to panic. Trust in your plan, take a brief moment to gather yourself, and head into the fray with confidence. You should probably cancel any dinner reservations though...you'll be here a while. If you don't have a plan in place it's likely the cost of your recovery could double. We've seen it happen more than once. Gather your team. Every organization should have a crisis team with the authority to make major decisions on short notice. You'll want key representatives from groups like management, legal, PR, and any specific area experts called for, to give you a well-rounded view. It's important that you can gather this team quickly, and while technology continues to make this easier every year you will need to account for the possibility of major events rendering even telephones temporarily unusable. Evaluate. What exactly are we looking at, and what level of response is warranted? While you don't want to under-react, doing something like sending the CEO to appear live in response to a smaller localized issue can lead audiences to believe there's a bigger problem than truly exists. Gauging this is easier said than done, though some basic crisis preparedness - things like defining what constitutes different levels of crises for your own organization - helps tremendously. The most important thing to remember is that this knowledge, along with things like crisis planning, training, and prevention efforts need to be incorporated into daily practice. It's not fun to think "What could go wrong? ", but it's a lot better than spending time looking at lost profits and customers flocking to the competition. Erik Bernstein is Vice President of Bernstein Crisis Management, a specialized firm dedicated to providing holistic strategies for managing crisis situations. If the name Dennis Mileti is unfamiliar, your emergency management education has been severely neglected. His book, Disasters by Design, and his many papers and speeches have had a profound impact on national policy towards natural hazards and disasters. One of his major contributions has been in the field of disaster communications. 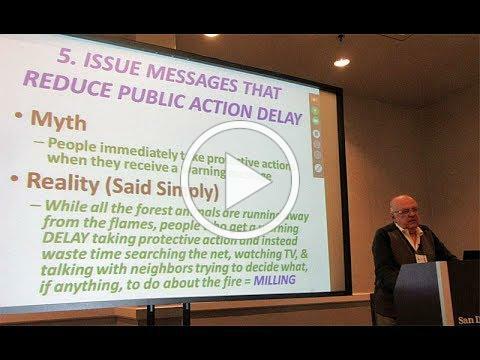 In this short video he explains how to effectively craft and deliver warnings that will resonate with the public and avoid common mistakes that can dilute your message. When it comes to disasters, we are almost always our own worst enemy. It's generally accepted that emergency managers, as a group, have a higher than average tolerance for ambiguity in crisis decision-making. A recent study, however, suggests that this may not be the case. Welcome to the March edition of Emergency Management Solutions. For over ten years now, I've been a one man show as far as this newsletter is concerned. It's been a challenge constantly offering new perspectives and keeping content fresh. That all changes this month. Joining me in collaborating on this newsletter are Tim Rieker and Erik Bernstein, two writers who have greatly influenced my own thinking over the years. Tim is an experienced emergency manager and consultant with a strong background in operations. He's particularly adept at analyzing federal guidance and planning documents and his articles are always insightful and thought-provoking. Erik is vice president of a crisis management firm and brings a different perspective to crisis response. His focus is on reputational risk and crisis communications. I think you will find his ideas about media relations and public warnings extremely useful. One last bit of good news: the release date for the second edition of my book is set for April 30 and it is now available for pre-order on Amazon. I'll have more to say about the new edition next month. If you've spent more than ten minutes as an emergency manager, you've probably heard the famous quote from General Eisenhower about plans being useless but planning essential. It's as valid today as it was when IKE first used it but maybe we should ask, "If plans are so useless, why bother writing them?" Part of the problem is how we use plans. To many, a plan is like a cookbook - you follow the recipe to get the results you want. I have seen numerous plans heavy with detail, suggesting that planners have tried to foresee and plan for every possible contingency. However, it should be obvious that one cannot plan for every possible contingency. The true risk in thinking that this is possible is that you begin to expect the disaster to unfold in exactly the way the plan says it will. This expectation creates confirmation bias that allows one to accept only facts that confirm expectations. Workshops, plenaries, and breakout sessions highlighting how to build, engage, and amplify the work of the emergency management academic community while focusing on diversity, inclusion, and unity of effort. The theme of the 2019 Workshop will be Convergence. Explore how we come together to study hazards and disasters, apply the knowledge that's generated, help one another, build community capacity, implement meaningful policy, and envision a future that leads to reduced disaster risk and improved social well-being. The goal of the IAEM Annual Conference is to improve knowledge, competency level and collaborative skills. IAEM accomplishes this by attracting relevant high-profile speakers to address current topics and practical solutions. What does the Tokyo earthquake of 1923 have to do with Japanese politics? How did the eruption of a remote Icelandic volcano in 1783 kill 23,000 people in England alone? Why does no one recall the great flood in California in 1861-62 that put Sacramento under sixteen feet of water? These are just a few of the questions that Dr. Lucy Stone addresses in her fascinating book. A former seismologist with the US Geological Survey, Stone surveys a dozen major events ranging from the destruction of Pompeii in 79 CE to the Tohoku earthquake in 2011, describing in layman's terms the geology behind the events. What makes the book fascinating, though, is Stone's attention to the changes resulting from each event, ranging from political restructuring to sociological changes. The book is an easy read and holds your attention. There's a lot of good information and some serious food for thought for those involved in recovery planning. Highly recommended. ©Lucien G. Canton 2019. All rights reserved.